We read this last month for our book club and while I probably wouldn't have picked it on my own, I enjoyed it a lot. As a huge Disney fan I adore the author's nods to the original version. This was a very different version of the story but I really appreciated the incorporation of a few key moments from the Disney story. The main thing that made me rate this below a 5 was predictability. The ending was not a surprise at all and that was disappointing for me because I really enjoyed everything else about this book. Meyer does a wonderful job creating this human/cyborg class system and all of the problems that affect this world. The grimy mechanic shop to the spotless palace was all done very well and I felt immediately at home in this world. Cinder herself was a fun character to get to know. Unlike the Disney version, she's smart, feisty and a bit reckless which makes for a much more interesting story. Prince Kai wasn't just a figure head and his motivations really made the story come alive. With the whole world on his shoulders, Prince Kai steps up and is willing to do whatever it takes to protect his people which I admire. 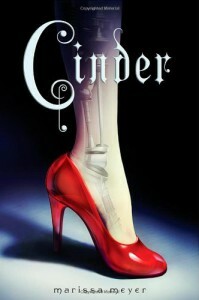 All in all I really enjoyed Cinder and would highly recommend it. I will be picking up the next in the series.